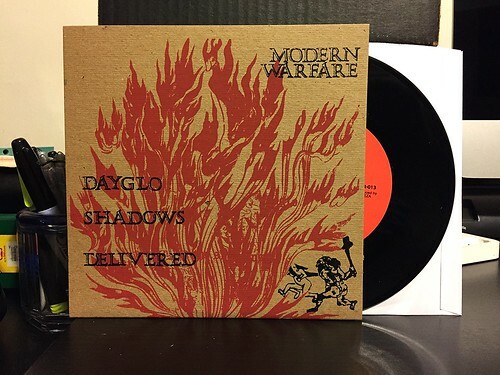 I Buy Way Too Many Records Dot Com: Modern Warfare - Dayglo Shadows Delivered 7"
Modern Warfare - Dayglo Shadows Delivered 7"
The folks at UT records have been pretty great about sending me copies of their records as they've come out. I'm glad as there have been many more hits than misses so far. Also exciting is that they have been doing more vinyl as of late. This Modern Warfare 7" is the second time they've reissued an old 7" from a largely forgotten band. I can't say that I was particularly familiar with these guys prior to getting this 7", but based on what the original pressing seems to cost on Discogs, they must be well known to others. I have to say that this is probably my least favorite thing that UT has sent me so far. While I would not call it bad or anything like that, it's not really the sort of punk rock that has ever been my thing. I think it's probably the vocals as there are a lot of older 70's and 80's punk bands that have a sort of nasally sneer that I've never been been able to get behind. There's some good guitar work and the treble heavy guitar tone lends itself to the vocals, but I can't help but think it just sounds kind of old. I'm not sure that's a valid criticism as it is old. This 7" came out in 1980 and was recorded and pressed with the sort of punk rock budget that came with those times. If you are into the punky power pop of this era, Modern Warfare is probably more up your alley. For me, I'm just more stuck in the 90's I guess. China Drum - It's Punk Rock, Son 7"
Against Me - The Daytrotter Sessions 7"
Unwound / Steel Pole Bathtub - Split 7"
Prince - In The Living Room 7"
V/A - Jabberjaw No. 1 7"